I was contacted recently by Ross Marsden, a meteorologist at MetService (the Meteorological Service of New Zealand. He had seen the photo in my April 30 2012 post and observed that it was a circumhorizontal arc — not an iridescent cloud as I had identified it. 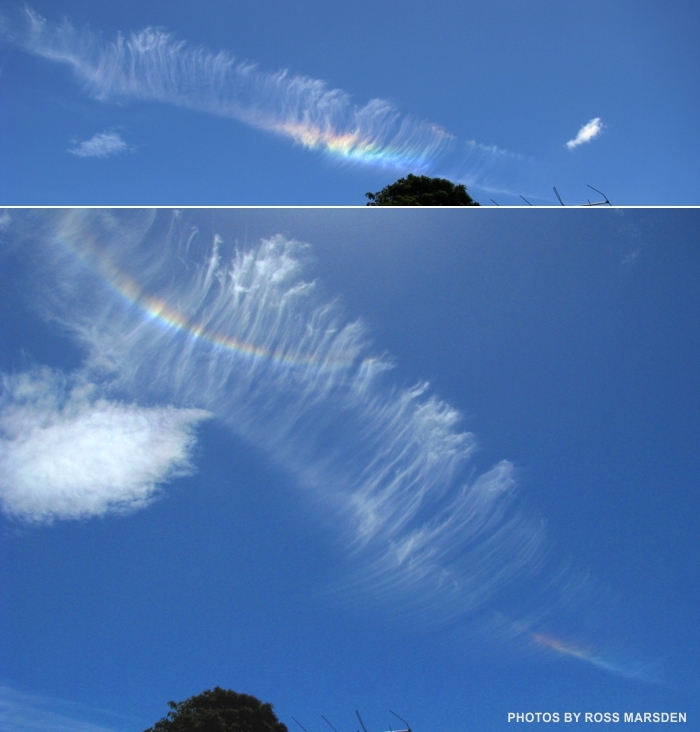 He sent me the two images above as examples of a circumhorizontal arc. I thank him for his feedback, and for his permission to publish those photos. 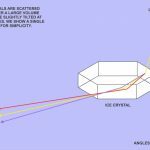 I have several meteorologists subscribed to Sky Lights and have learned from their comments on more than one occasion. If you follow those last two links, you’ll see that both phenomena involve rainbow-like colors and both are seen in clouds, but the similarity ends there. Rainbows can be seen in a “clear” sky (albeit one with water droplets suspended or falling in it), and rainbows are always opposite the Sun in the sky. But circumhorizontal arcs and iridescent clouds are seen within clouds. Both phenomena are commonly called “fire clouds” but have nothing to do with fire. Marsden’s photos show a circumhorizontal arc as it evolves in the same patch of sky. The bottom image was taken 4 minutes after the top image. The bottom image also shows a brighter segment of the 22° halo, with the dimmer circumhorizontal arc at lower right. As the clouds drift, the circumhorizontal arc will move with them. The Sun is near overhead, and the arc can only form at a distance of 46° from the Sun. 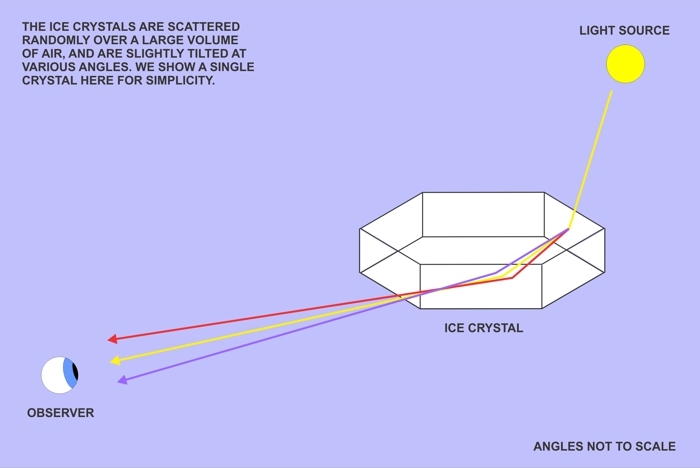 Click on the thumbnail below to see a ray diagram showing how the phenomenon is produced. Note that the sunlight is refracted twice. The first time as it enters a vertical face of the ice crystal, the second time as it leaves the bottom face. In both cases, the shorter wavelength violet light is refracted by a greater angle. Red light is refracted by the least angle. This accounts for the appearance of red at the top of circumhorizontal arcs — a feature that distinguishes them from iridescent clouds. By comparison, iridescent clouds are produced by microscopic water droplets (or tiny irregular ice crystals) suspended in the clouds, and the colors are produced by diffraction and interference. Hence, there is no fixed pattern to the colors produced. Further, iridescent clouds are closer to the Sun in the sky — usually less than 46°. They are often not visible unless the bright Sun is blocked by a cloud or structure. Marsden also points out that, since the effect requires ice crystals in (usually) cirrus clouds, the full 360° arc is rarely seen. Rather, the arc can be fragmented around the sky. This is what was happening in the photo in my April 30 2012 post, which I mistakenly identified as an iridescent cloud. I have now added a note to that post correcting my identification and linking back to here.